Now, is there any way to force the fonts colour? or, if nothing else works, could you guys suggest a way to turn the Sidebar in Nautilus to black? Any nice dark gtk+ theme suggestions are also welcome. From the Hope theme page I see that in the comments more people are complaining about this issue after upgrading. So, my question now is: any way to control the system font colours? Or please suggest a them which adds black sidebars in nautilus. Unfortunately it did not solve the problem, however, now my Ambience theme is gone.... I can't even find it in /usr/share/themes. And now my entire desktop looks a bit crap. Menus don't seem right. Can I install the default Ambience theme from somewhere? After upgrading to 12.04, I ran into the same problem with a couple of my old themes. They needed to be upgraded to (I think) in order to work properly with Gnome 3.4. 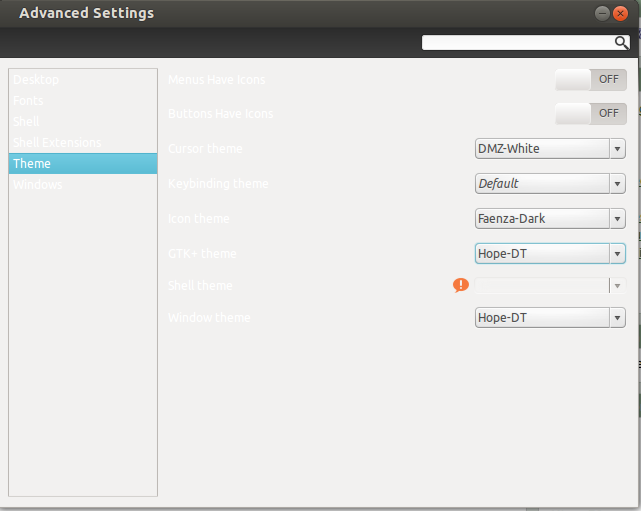 I went to the creator's website and found a version for Ubuntu 12.04, and it has worked perfectly. This might be what you need to do, too. If you access the Launchpad page for it (launchpad), I think you'll find a version for precise. Not the answer you're looking for? Browse other questions tagged 12.04 themes gtk or ask your own question. How can I repair the default GTK libraries after installing GTK 3.4 from source? How can I theme Synaptic Manager?